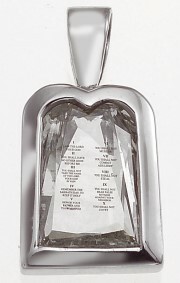 Patent Office approves Ten Commandments Diamond® trademark. Name now registered. 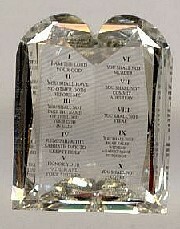 The Ten Commandments Diamond® has the shape of the familiar tablets given to mankind many years ago. A unique brilliant faceting applied to the stone adds a scintillation of brilliance around the edge so that the laser inscription on the table facet of the diamond can be clearly read with a jewelers loupe. The colors and clarity of the diamonds are determined by the individual piece of rough diamond used. Inscribed and Set. 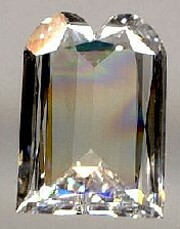 This Diamond weighs 1.29 Carats "I" color and SI1 clarity. It measures 8.11 mm long X 5.69 mm wide X 2.75 mm deep. Set in 18kt White Gold. Inscribed. This Diamond weighs 1.37 Carats "I" color and VS2 clarity. It measures 9.24mm long X 7.26mm wide X 1.94mm deep. Un-Inscribed. This Diamond weighs 1.05 Carats "E" color and VS1 Clarity. It measures 8.16mm long X 5.91mm wide X 2.17mm deep. Inscribed Sapphire. 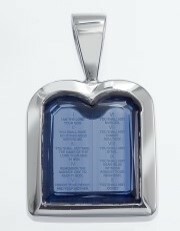 Set in 14 karat white gold pendant. The saphire weighs approximately 2.00 carats.